The outstanding Wax-cellence wax is a technologically advanced formula which makes hair removal super easy and convenient in the comfort and privacy of your own home. It is safe and easy for beginner’s use and suitable for all facial and body waxing – including Bikini and Brazilian. 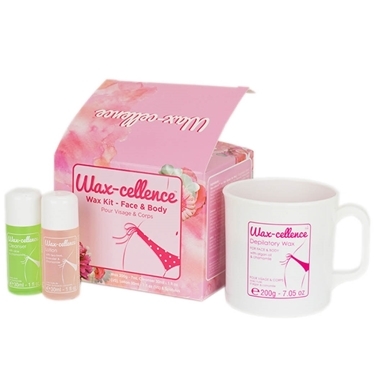 The Wax-cellence home waxing kit includes a professional blend Hybrid Hot Wax in a delightful pink, Gentle Skin Cleanser, Gentle Waxing Lotion, assorted spatulas and detailed personal waxing instructions to help you achieve the best and gentle hair removal every time!